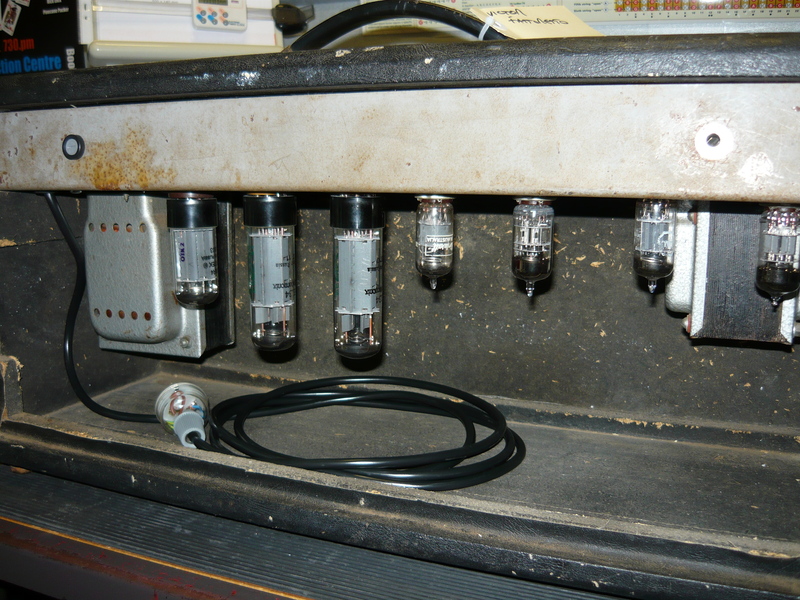 Another ZJM amplifier in our workshop. Welcome back to the blog, everybody ! We haven’t published a new blog for about 6 weeks, but things have been rather busy at the Richards Amplifier Company – Australia. 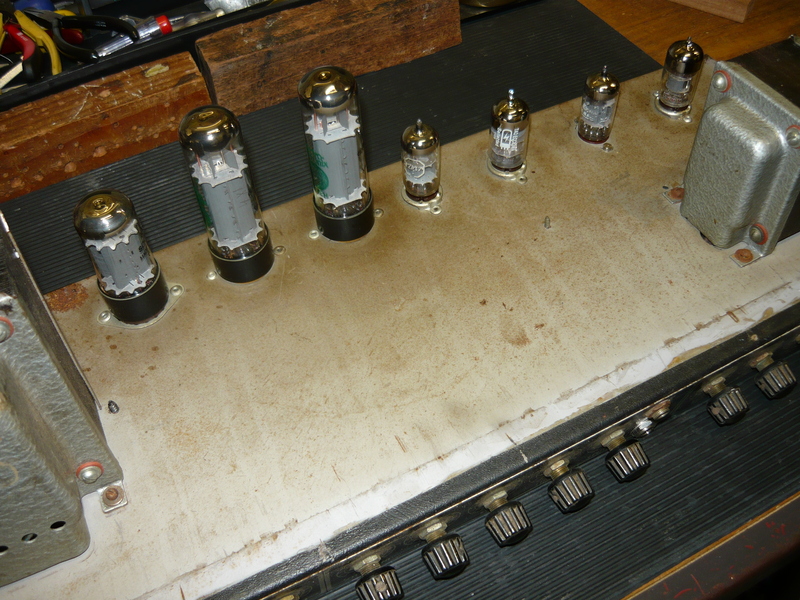 Well, it was quite a surprise when we were recently contacted by our very good customer Victor, to say that he had acquired a Vedette EL34 amplifier, built back in the 1960’s in Sydney by ZJM Industries. 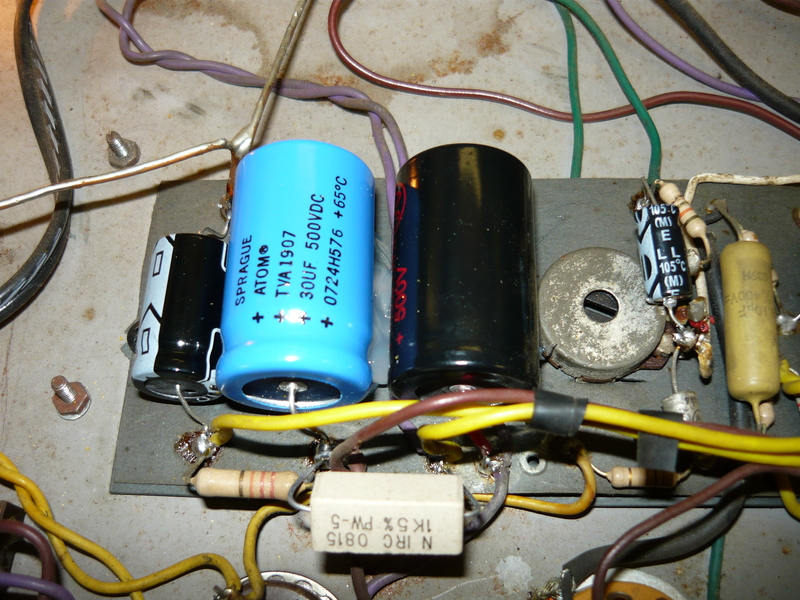 This is the first ever Vedette amplifier that we have encountered, and only the third amp by ZJM, so not many appear to have survived. For a more detailed discussion of ZJM Industries, please check our blog dated June 26th 2012, titled the Challenge guitar amplifier. The Vedette is loosely based on the Fender “Blackface” amp designs, pre-reverb, but with EL34/6CA7 output valves and those big Aussie transformers that we noted with the Challenge amp. The sweep of the controls on the Vedette is a bit different, and the midrange is a bit bigger. The standout feature is probably the valve-driven tremolo, which gives the amp a lot of character. While the EL34 & GZ34 valves had been replaced at a previous service, many important service issues had been completely overlooked. The photo to the right shows we replaced a couple of power supply caps that were well past their use-by date. 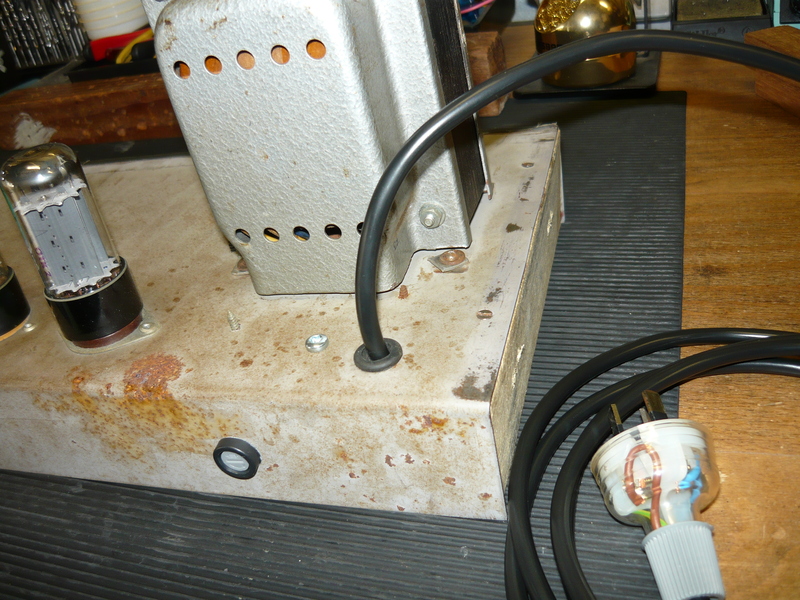 The speaker jack & #1 input jack on the tremolo channel also required replacement. 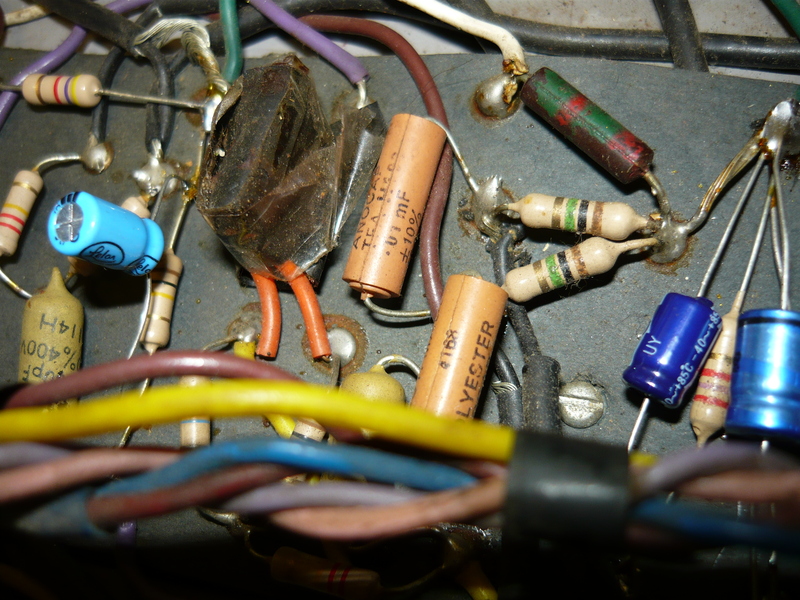 The tremolo didn’t work at all, which required a new 12AX7 plus a cathode bypass capacitor. The prescence control was no longer functional, as a result of someone’s experiment, and required rewiring. 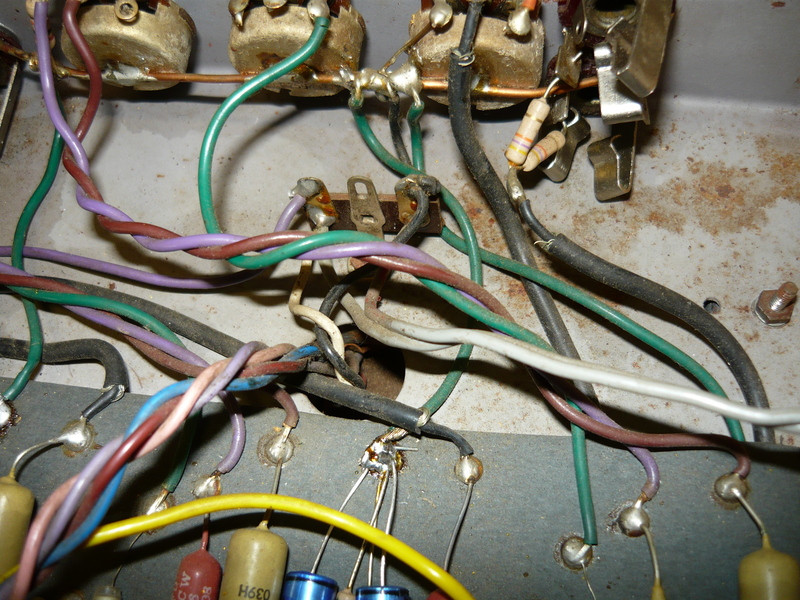 But the most significant outstanding problem was that this amp was electrically unsafe to use ! We installed all new 240V 3-core cable & 3-pin plug, plus a fuse in series with the active (brown) lead, installed on the chassis rear panel, and also a dedicated chassis earth connection (not a shared connection). Now the amp is safe to use. The wiring in the Vedette is pretty rough in places, and the sweep of the tremolo and eq pots is a bit frustrating for the user, with most of the action compressed into a few degrees of rotation. But, actually the amp works fine and also background noise is quite low, in spite of the random routing of wiring, which pretty much breaks all the rules for audio electronics. Once again, we appeal to anyone out there who has some knowledge of the ZJM guitar and amp building enterprise in Sydney back in the 1960’s, to make contact and perhaps we could publish a more complete history. We will be back soon with a new blog publishing some photo’s of Victor’s new Richards Blue Mood series 12W 6V6 amp. 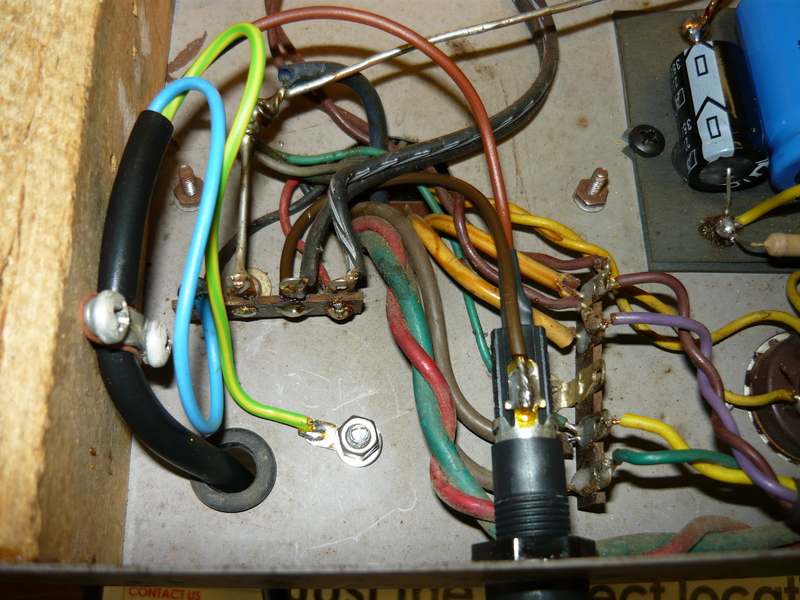 This entry was posted on August 31, 2012 at 12:25 pm and is filed under Amp Repair, Amps. You can follow any responses to this entry through the RSS 2.0 feed. You can leave a response, or trackback from your own site. HI Around 1961 to 1964 I first Purchased a fender strat copy( Left hand) produced by Mr Melnick he then had a shop in Bronte road Charingcross near Bondi Junction I have a amp in my gararge that he produced by him also it has 2 x12 inch speekers ,reverb speeker and tremolo .My son in his junor days got to playing and changed the vaccume tubes so do not know the tube positions also the reverb springs are missing 2 millisecond delay Mr Melnick told me years ago as they used to brake down a bit . I still have this stuff and after fourty years and loosing my hearing in an industrial accident I have just picked up the guitar again and playing some of the old tunes by vibration is kind of wonderful ! Hope this is interesting for you ! But I knew Mr Melnick he was a lovely fellow ! thanks Bob, for your comments – IR. I purchased a Vedette (60w) similar to the one at the top of this page in the early 70s and still use it from time to time . The head is in very good nick ( internal/external/sound) and just got its serviced a couple of years back by a valve specialist . The valve guy said it was a rare beauty and well worth insuring for a value which I did . He said they just dont make transformers that good anymore. it was very well and tidely wired compared to another he had seen years ago. It is now back in safe storage . Unfortuneately the matching speaker cabinet and speakers fell apart years ago. I instead play the vedette through a fully enclosed black vinyled speaker cabinet my dad abd I lovingly built together in 1973 encassing 2 X 12” Plessy 12U50s..Great full tone /sound . 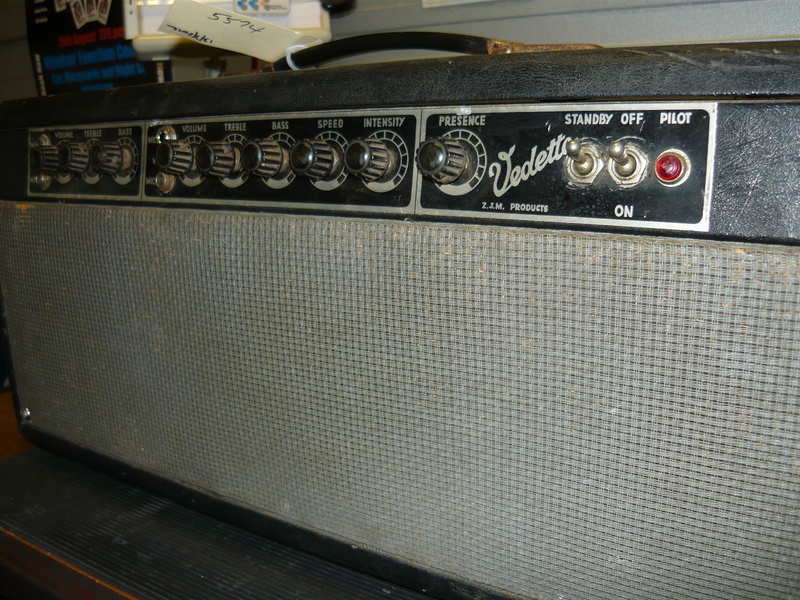 Although i have no intention of selling soon does anybody know how much a vedette 60w head in good condition would be worth ? Paul .